To enrich and modernize the harmonization of a piece it is common to use fourth chords. 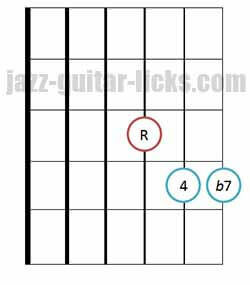 They can replace some original chords to bring more melodic freedom into improvisation and more tension in harmony. Since the late 1950s, harmony in fourths has played a very important role in the development of modern jazz. Musicians and composers have used a lot the quartal harmony. Among them, the great American pianist McCoy Tyner, who, is a master in the art of playing quartal chords. Mike Stern, Herbie Hancock, Chick Corea, Bill Evans and Kurt Rosewinkel have also used this technique. 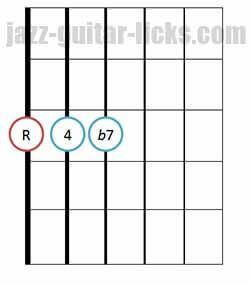 In this lesson we will see how to build chords in fourths, how to harmonize the major scale with and how to use them in comping. How to Build Chords in Fourths ? What's a Fourth Interval ? A perfect fourth (4) is built with five semitones, it is either considered major or minor. For example, D is 5 semitones away from G. This is a perfect fourth interval. An augmented fourth (aug4) is constructed with 6 semitones. Example with F and B. What's a Fourth Chord ? Built by stacking 2 perfect fourths (4 + 4). 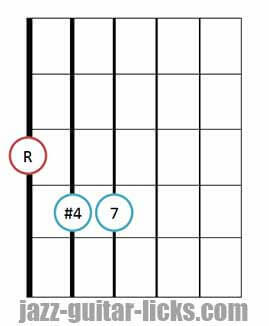 This is the basic fourth chord. Built by stacking 1 perfect fourth and an augmented fourth (4 + aug4). Built by stacking an augmented fourth and a perfect fourth (aug4 + 4) . 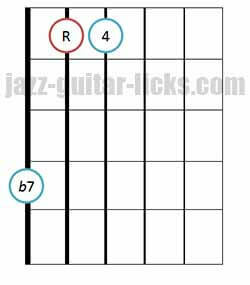 Building a three-note chord built in fourths in its pure form is quite easy. Starting from the fundamental, you just have to stack notes separated by intervals of perfect fourths. Example with C.
F (11) is the fourth of C (5 semitones away from C). Bb (M7) is the fourth of F (5 semitones away from F). 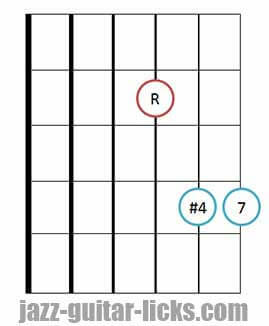 When stacking these three notes, we obtain a three-note chord built in fourths C-F-Bb. 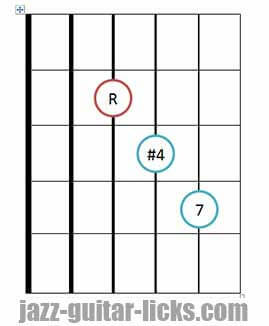 Here are the fourth chord voicings and their respective guitar diagrams with basses on 6th, 5th, 4th and 3rd strings. How to Harmonize the Diatonic Scale in Fourths? 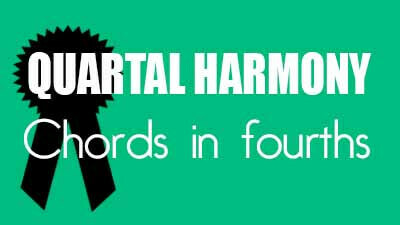 All the chords from the harmonized major scale are made up of perfect fourths (4th + 4th). Except for the I and IV degrees because of the harmonization, are respectively built with 4th + aug4th and aug4th + 4th. These four positions are related to the degree I of the major scale. They are built by stacking a perfect fourth and an augmented fourth. The four following guitar diagrams are related to the degree IV of the major scale. They are built by stacking an augmented fourth and a perfect fourth. Quartal harmony yields a somewhat harmonically ambiguous sound because the voices have a less direct relationship to the root of the chord. It is difficult to indentify a tonal center with chords built in fourths. 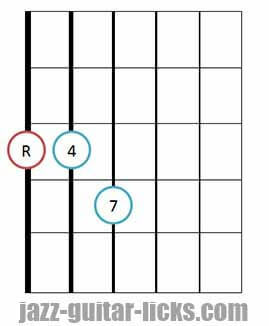 There can be more than one chord quality for a fourth chord. 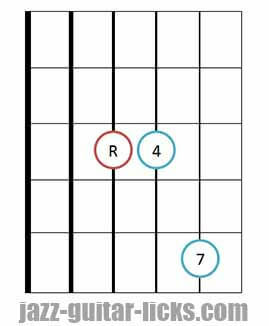 Here are some examples that show you how to play the C major scale harmonized in fourths on the guitar. Quartal harmony of C major scale starting from the I degree. Quartal harmony of C major scale on strings 6,5 and 4. This example starts from the V degree of the major scale. Quartal harmony of C major scale on strings 5,4 and 3. Quartal harmony of C major scale on strings 4, 3 and 2. This one starts from the III degree. Quartal harmony of C major scale on strings 3,2 and 1. This example starts from the V degree. 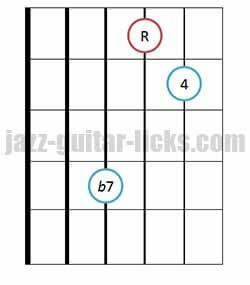 Adding another fourth in addition to the three-note chords previously seen will help you create more interesting chords. The added tone forms an interval of a tenth with the bass note. It can be considered as a redoubled third (We call a redoubled interval, a simple interval carried in its octave). This note can be b10 or 10 (major or minor third) depending on the harmonization. Quartal harmonisation of the C major scale with four-note chords on strings 6, 5, 4 and 3. 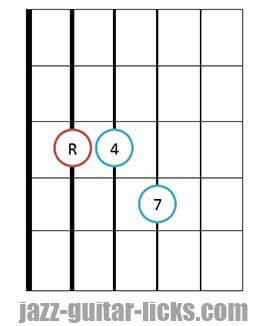 Four-note chords on strings 5, 4, 3 and 2. Chords on strings 4, 3, 2 and 1. What is The So What Chord? The "so what chord" is a modern sounding voicing often used as an alternative to quartal voicings. It consists of a fourth chord (in its pure form) and a major third added on the top of the chord. In other words, three perfect fourths and a major third are stacked. The origin of its name would be due to its use by Bill Evans in the head of "So what" by Miles Davis. 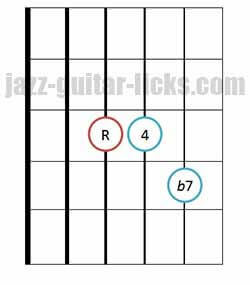 Here is an illustration of the "so what" chord. This one can be named Em7add11. 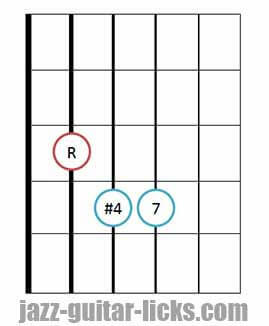 Bar at the 7th fret with your first finger, put your second finger on the 2nd string at the 9th fret and you get the Em7add11 chord. 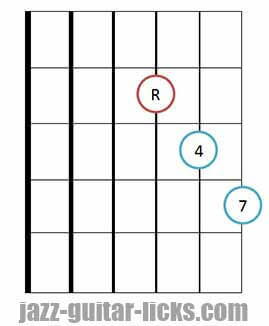 The "So what chord" is identical to the standard tuning of the five lowest strings of the guitar. (E-A-D-G-B). Some teachers and music methods named this chord m11 , but theoretically m11 chords must contain a 9. That is not the case here, so what chords are made up of 1, 4, b7, b3 and 11. It is preferable to name them m7add11. So what, by Miles Davis, from the best selling jazz album of all times (Kind of blue) is surely one of the most popular modal jazz tunes. It is an AABA form centered around the D Dorian mode and modulating from Dm to Ebm. Chord progression consists of 16 bars of Dm7, 8 bars of Ebm7, and 8 bars of Dm7. It is fairly simple to play, to understand because there are no harmonic progressions, this is the principle of modal tunes. First, the theme is played by the bass and then the two "So what chords" are played by the pianist (Bill Evans). 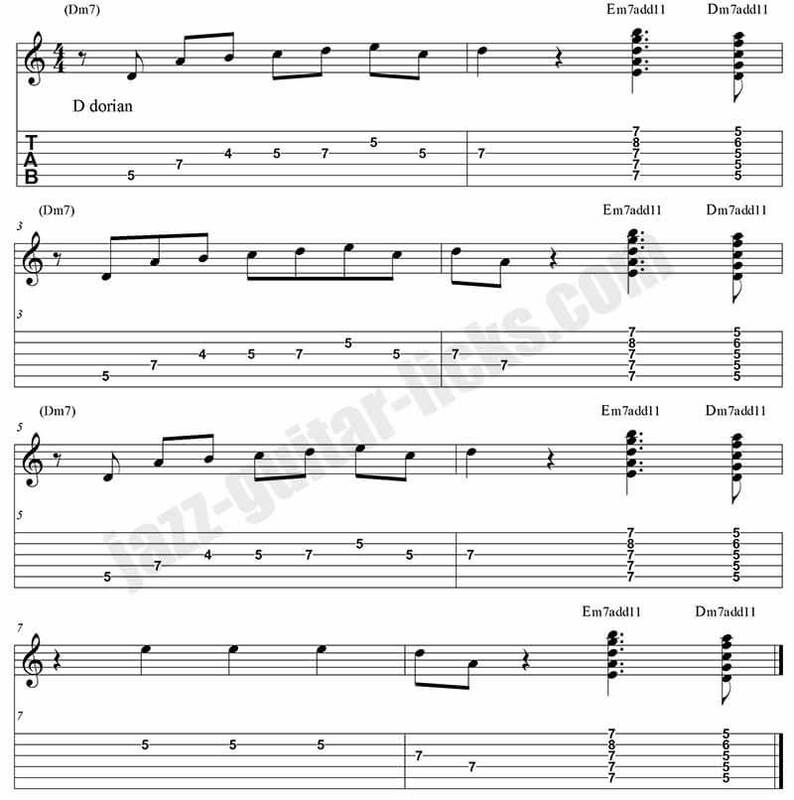 Once you have mastered this, you have to play the same lines and chords a half-step up (Ebm). This way Em7add11 becomes Fm7add11 and Dm7add11 becomes Ebm7add11. 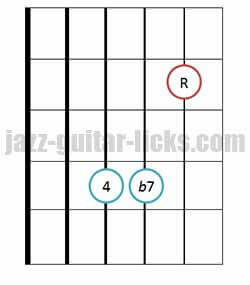 There are other examples of "So what chords" in "Impressions" by John Coltrane. McCoy Tyner was fond of this quartal harmonization. The chord progression is the same as "So what" (16 bars of Dm7, 8 bars of E♭m7, and 8 bars of Dm7). There are many ideas of comping to pick up, so listen carefully and try to transcribe them. For the time, here are three examples using "So what chords" taking from "Impressions". A Fmaj7 is added between Dm7add11 and Em7add11. 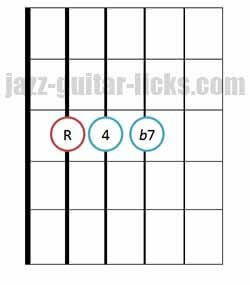 You can visit this page to see how to play major seventh chords on the guitar. 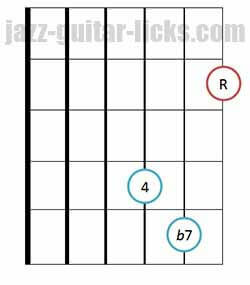 Here are the chords of the B section. 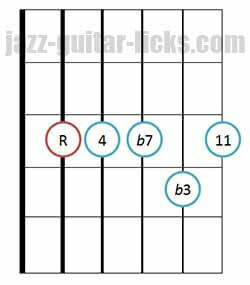 How to make your basic guitar chords sound more jazz. 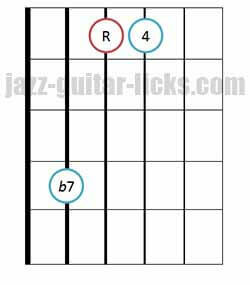 How to turn basic bar chords into jazz chords. 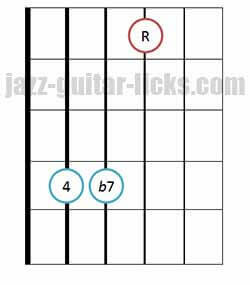 This jazz guitar lesson for beginners answers these questions by using guitar chord diagrams and formula charts. 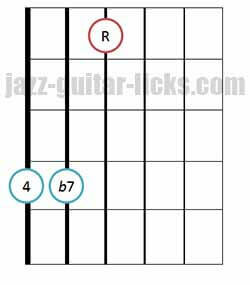 11 blues progressions for jazz guitar. Printable PDF eBook with tabs, analysis and audio files. Comping and chord studies. 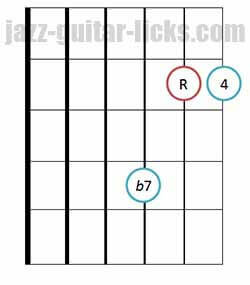 This jazz guitar comping lesson provides you different ideas using drop 2, inverted and extended chords to apply to "there will never be another you"
This lesson show you how to play half diminished guitar chords (also known as m7b5) on the guitar and how to apply them over II-V-I progressions.